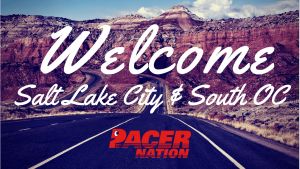 The Pacer Nation is pleased to announce the start of two new clubs: Salt Lake City, UT and South Orange County (OC), CA. These clubs are started by Pasadena Pacers members who have moved away and decided they just had to bring Pacer love to their new communities. The Salt Lake City Chapter founder John Day is a long-time Pacer and very skilled runner. Kate Champion (perfect name for a runner) graduated from many Pasadena Pacers programs and is bringing the Pacers with her to southern OC. While both these clubs are working out the details (location, routes, etc. ), they have both started Facebook pages to get the juices flowing. Please be patient as they get things going, but do drop by for a run if you are in Salt Lake City or South OC! If you have moved away and are interested in starting your own Pacer chapter, now is the time and we are here to help. Our Pacer Nation is growing and we couldn’t be prouder for it. The Pacer Nation is a group of free, supportive running clubs looking to raise the health and spirits of our communities. Oh, and we run, too. Come as you are—out of shape, super fit, and everything in between—you’ll fit right in. We’re free, friendly, and for all. The Pacer Nation: Connecting and Supporting Runners for Life.